Attract more birds to your backyard with a water feature! Our bird baths are available in several different material choices: plastic, resin, and glass are standard, we also occassionally bring in metal, cast concrete and glazed ceramic. 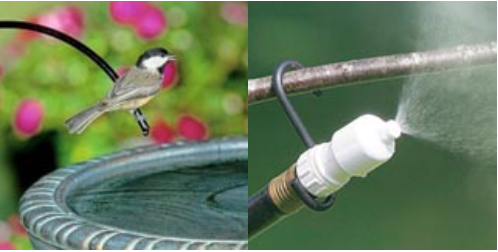 Birds love moving water, you may want to consider adding a water-wiggler, mister, dripper, or solar pump. TDI is one of our favourite lines of bird baths; made of a composite material comprised of clay and fibre that has been plasticized. 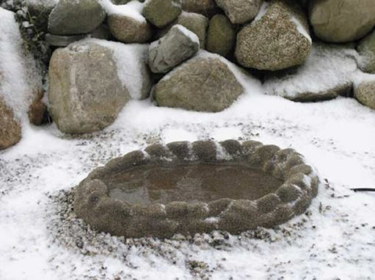 The base can be filled with sand or gravel for extra stability. Suitable for year-round use with the addition of a de-icer. 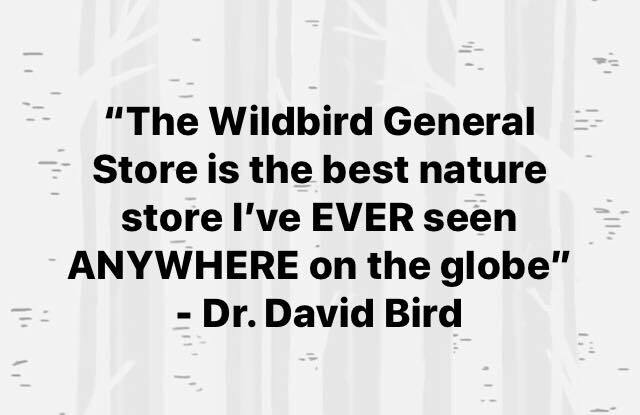 We carry simple plastic bird-safe plastic dishes made by ERVA. These are available as just the dish; or add a table top ring stand; hanging support rings; mounted deck clamp; ground-staking pole; or attachment for 1-inch modular metal pole systems (which we also sell). These can also be used in the winter by switching out the dish with a heated dish, also made by ERVA. 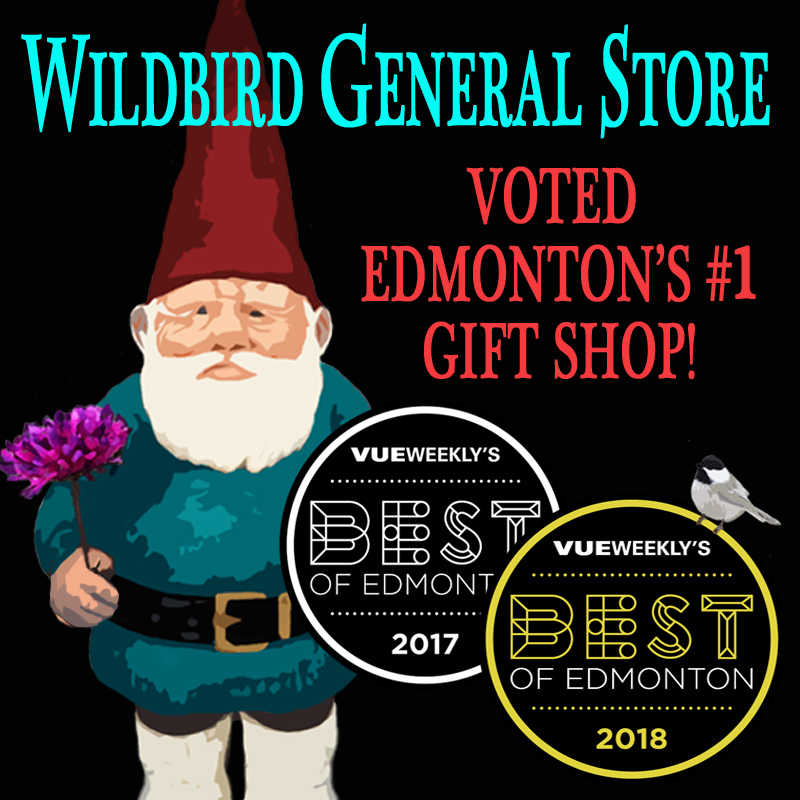 Our collection of decorative glass bird baths is ever-changing, so be sure to visit us in store to view our latest selection. 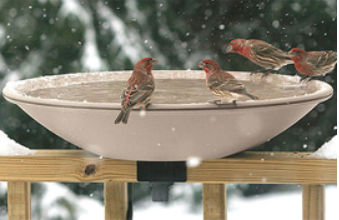 Bird baths can be used in all the seasons, not just the summer! We have several different types that can be used for those -30° days. 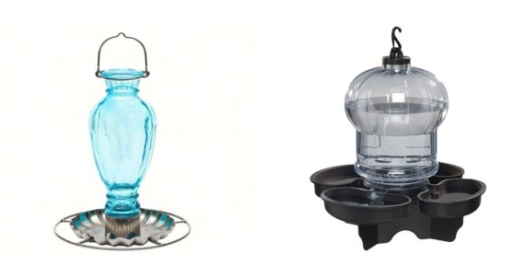 Our favourite heated-bird bath has a fully encased heating element in a high-density plastic. Available with or without pedestal. Some models of heated deck rail mount/clamp birdbaths tilt for easy emptying. Four-season ground models with a natural looking sand-coating can be used in yards free of cats. 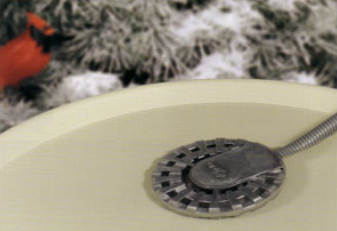 Drop-in de-icers can be used with existing winter-safe bird baths. Note: It is rare for birds to freeze in the winter due to open water. Healthy birds are able to shake off water from their feathers & their feet are covered in scales that will not freeze when wet, but we do recommend that heated bird baths not be used immediately beside chain link fencing. Solar-powered pumps and fountains add movement to water, inhibiting mosquitos, while attracting birds. Bird bath drippers attach to your garden hose, allowing either a steady drip or constant stream, you decide. Misters are enjoyed by small birds, especially hummingbirds. 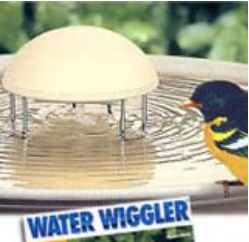 Water Wigglers™ prevent mosquito larvae from hatching in your bird bath. Available as battery-powered, with or without changing LED lights, and solar-powered. Waterers are great if you don’t have a lot of room – they can act as a water dish and a bath for small birds.